A small team of five, the employees are credited with the success of the business. Pictured from left are: William Hicks, Kelly Warner, Dustin DeVore, Jeannie Emery and Mark Jarrett. After hours is usually only time of day the dock at Mountain Grove Agri Services isn’t lined with cars. Mountain Grove MFA assistant manager William Hicks can frequently be found on the floor of the retail store answering customer questions. When dairies in the area began dwindling, one of the first product lines the store expanded into was fishing tackle. Here, Hicks talks with Gary Gasperson, left, and his son Daniel. Feed mill employee Orion Wikert helps load feed into vehicles on a busy Friday at the retail location. Bagged feed is a large part of the business at South Central MFA Agri Services in Mountain Grove. When dairy business began to decrease, the Mountain Grove store had to change along with shifting industry. This line of grilling sauces has been a popular seller. Warehouse Supervisor Mark Jarrett prepares to load supplement tubs onto a customer’s trailer. Livestock supplies make up a good portion of Mountain Grove’s business. New Manager Dustin DeVore brings to the retail store many years of experience with MFA. He has served as a manager for both the Marshfield and Ash Grove locations and as an MFA livestock consultant. IT’S A BUSY FRIDAY MORNING at South Central MFA Agri Services in Mountain Grove, Mo. Country music plays softly in the background as em­ployees ring up orders of bagged feed, boots and salt for customers gearing up for an upcoming snow. The weather isn’t the sole reason for the line at the counter, though. DeVore became manager of the Mountain Grove location in January after longtime manager Darren Scheets was promoted to another position within the company. DeVore previously managed the Marshfield and Ash Grove lo­cations, served as a livestock consultant and supervised the warehouse in Ash Grove early in his career. Once an area of the country primarily dedicated to the dairy industry, the farms in the region have had to transform to stay in business. Mountain Grove MFA has changed right along with them. Agriculture here is now mainly centered around beef cattle, though there are goats, sheep and swine, too, DeVore said. Instead of large-ticket sales, the store needed to bring more foot traffic through the door for survival. Items such as toys, sleds, Carhartt gear and food products provided that opportunity. When farmers come in for a bag of feed or seed, they often leave with a package of Burgers’ Smokehouse meat sticks for the field later. And in a community of fewer than 5,000 people, this inventory diversification helps Mountain Grove MFA bring in other customers from the community who may not be farmers. When the store’s employees began to see the drop in dairy sales, one of the first areas they expanded into was fishing tackle. An avid fisherman himself, Hicks said he knew there might be a niche for these products. What started as a small end-cap on one of the aisles eventually grew to an entire wall. Recognizing these kinds of trends in the community certainly helps. When former manager Scheets saw the Twisted X brand of shoes gaining popularity, he contacted the supplier to figure out how the store could begin carrying them. Conversely, when a supplier no longer offered a popular grilling sauce, Hicks went straight to the manufacturer to keep it on the shelves. She gestures to a rack next to the counter displaying several flavors. It’s sometimes trial-and-error, Warner said, but when they find something that works, they order more. Most of their wares are discovered at trade shows, like the MFA Buyer’s Market and the West Plains Veterinary show. As busy as the retail store is, catching a lull in the warehouse is also rare. Vehicles line the loading dock awaiting orders. Though he hasn’t been there long, DeVore said the store was going through two to three semi-loads a week of bagged feed at the time, making up approximately 25-30 percent of the business. He estimated farm supply and seed make up another 25-30 percent. Seasoned warehouse supervisor Mark Jar­rett, a 23-year employee, said business has picked up over the last several years. It may be Mountain Grove MFA Agri Services that has the right products and ser­vices to keep customers coming through the door, but DeVore credits the employees for the success of the business. Written by Allison Jenkins on 01 April 2019 . Tiffanie Weekley, left, began her own farm business after seeing the benefits of primarily pasture-based beef to her family’s health. In front are daughter Kaitlen, son Samuel and daughter Allison. In back are Tiffanie’s husband, Tim, family friend and coworker Clayton Marshall, and Allison’s husband, Justin Griffin. In a process that takes 48 to 72 hours, Tiffanie makes beef bone broth in her kitchen as one of the offerings of Morning Glory Farms. The process starts with roasting the bones, then simmering them in water and apple cider vinegar before adding garlic, carrots, red onions, celery and seasonings. Making broth is one way to respect her cattle, Tiffanie said, by using as much of the animal as possible. Tiffanie manages the farm’s cattle while her husband, Tim, focuses on the row crops. For both sides of the business, the Weekleys rely on Heart of Missouri MFA Agri Services for advice and inputs, including minerals, which help keep the animals healthy and performing. The Morning Glory Farms herd consists of red and black Angus cows with registered Angus bulls. Tiffanie manages 80 head altogether, including Weekley Farms’ animals and her own. The herd calves in spring and fall to produce a steady supply of beef. Tiffanie unwraps a bale of hay to be ground into feed. Her cattle have full access to pasture at all times, but they’re supplemented with a custom mix of farm-raised forage, silage and grain along with a finishing ration from MFA. The combination provides the health benefits of grass-fed beef with flavor from the grain finish. Nurturing comes naturally to Tiffanie Weekley. Her life is devoted to taking care of others, humans and animals alike. She’s a mother of three, labor-and-delivery nurse, lactation consultant, farm wife and cattle producer. Add “entrepreneur” to that list of job titles. Two years ago, Tiffanie started Morning Glory Farms, selling grass-fed, grain-finished beef from her herd of black and red Angus cattle and made-from-scratch bone broth crafted in her family’s kitchen in Blackwater, Mo. It’s a business born from a mother’s love. Those changes started on the Weekley farm, where Tiffanie and her husband of 24 years, Tim, produce beef as part of their diver­sified row-crop and cattle operation. Tim is the fifth generation to work the land that’s been in the family since 1865, and his father, Douglas, still works part time alongside his son. In addition to Samuel, Tim and Tiffanie have two daughters, Kaitlen, 19, and Allison, 21, whose husband, Justin Griffin, also farms with the family. Before she got married and completed nurs­ing school, Tiffanie had studied animal science for a short time at the University of Missouri. Using that background along with her medical knowledge and help from a registered dieti­cian, the determined mother began researching ways to improve her family’s health through the food they ate. That research led right to her own backyard—more specifically, her pastures. With changes in their farm-raised beef along with other dietary modifications, the Week­leys began noticing positive results in Samuel. Tiffanie attributes the difference to an improve­ment in his gut health, which plays a critical role in shaping appetite, allergies, metabolism and neurological function. Her family’s health journey inspired the idea for Morning Glory Farms, and the business took root when Tiffanie joined the family operation full time in 2017 after one of Tim’s em­ployees took another job. Maintaining a part-time schedule as a lactation consultant, Tiffanie took over the family’s existing cattle operation and began building a herd for Morning Glory Farms, a name that reflects her strong Christian faith. It’s based on Exodus 16:7, “In the morning, you shall see the glory of the Lord.” She now man­ages a total of 80 cows—40 belonging to Weekley Farms and 40 owned by Morning Glory Farms. Tim admits he was more than happy to turn over the livestock reins to his wife. Cattle need proper gut health, just like humans, Tiffanie said, which is why her feeding program is focused on forages. However, she also knows that grain-based diets help improve marbling and flavor in the beef. Her bone broth, also known as beef stock, provides other health benefits that can’t be derived from eating meat alone. It’s made from cooking beef marrow bones and connective tissue in a long, slow process that extracts collagen and other beneficial nutrients. Every batch takes 48 to 72 hours to cook. Tiffanie hand-crafts the broth in the Weekley family kitchen and freezes it in 24-ounce and 8-ounce containers for sale. Direct-marketing the beef and broth has been a welcomed diversification to the family’s otherwise traditional farming oper­ation, Tim said. He raises some 3,500 acres of corn, soybeans, rye and wheat and helps Tiffanie maintain 400 acres of pasture and hay ground. The Weekleys participate in MFA’s Crop-Trak scouting service and Nutri-Track precision program and rely on Heart of Missouri Agri Services for most of their farm inputs. Marketing her farm products beyond friends and family has been one of the biggest challenges, Tiffanie said. She’s devel­oped a loyal, local clientele for her bone broth, and her beef can now be found at Hy-Vee in Columbia, the Blackwater Country Store and several restaurants in Kansas City, about an hour and a half away from the farm. One of those chefs is Michael Foust, owner of The Farmhouse restaurant and Black Sheep + Market. He opened The Farm­house in 2009 in the eclectic River Market district of Kansas City and has been working with Missouri and Kansas farmers from Day 1 to supply fresh ingredients for an ever-changing sea­sonal menu. Black Sheep opened in 2018, following the chef’s farm-to-table tradition plus a fresh market where products such as Morning Glory Farms beef can be purchased. Speaking of family, Tiffanie said her daughters are interested in getting more involved with the business in the future. Kaitlen is studying to be a dietician, and Allison is earning a degree in psychology. Their education fits well with the mission of Morning Glory Farms to improve the lives of its customers, Tiffanie said. 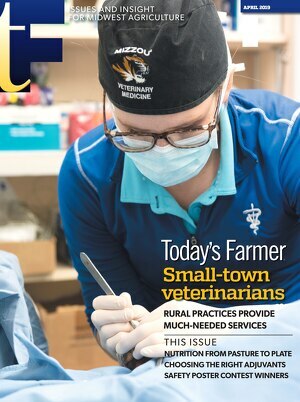 Tiffanie said she’s taking “baby steps” as she grows her enter­prises, careful not to compromise the care of her animals, the quality of her products or her time with family. Her immediate goal is to expand the broth business with wider distribution. Though juggling her roles as a wife, mother, business owner, part-time nurse and full-time farmer can be quite challenging, Tiffanie said she wants to set a good example for her children and for other women who have a dream they want to pursue. For more information about Morning Glory Farms, visit morninggloryfarms.net or call 660-621-3022. Watch more of Tiffanie's story.